Your gums don’t look or feel quite right. There may be bleeding, soreness, loose teeth, and bad breath. You may have noticed it yourself or we may have seen the signs during a regular hygiene and examination visit. In any event, we define your problem as “periodontal disease” and recommend further evaluation and treatment. Periodontal care takes many forms, including soft tissue curettage, exquisite cleaning of the sub-gum root surfaces (“root planing”), bite adjustment and the insertion of antibiotics directly into the periodontal defects called “pockets.” When the disease is modest, these procedures, along with good home care, a balanced diet, and regular, frequent hygiene services may be all that is required. However, when the disease is advanced, when substantial bone has been lost and the pockets are deep, surgery may be recommended as a viable option. Should we support the surgical solution and advise you to accept it? Herein lies a conundrum, because the general trend in medicine is away from purely surgical solutions. 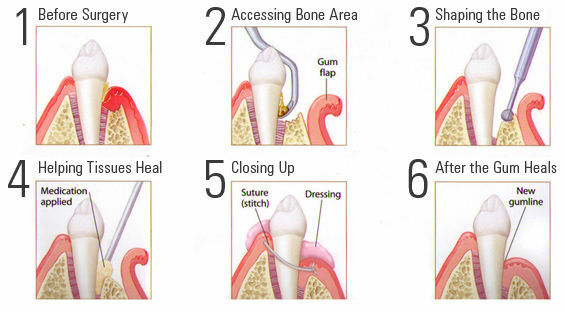 Researchers and advanced technology is calling into question the value of many common surgeries, periodontal included. Behind the change in mind set are growing numbers of studies which demonstrate that the side-effects of periodontal surgery are too often worse than the disease or injury itself. These studies have huge implications because so many of the procedures are now routinely covered by insurance. Having said this, however, not all patients are willing to give up the surgical option when presented with other choices. The alternatives often involve unappealing life and habit changes that many people simply can’t sustain over the long term. This is especially true with the non-surgical control of periodontal disease. Periodontal Surgery immediately provides a healthy environment, which needs support, of course, but can be well maintained by a person of ordinary motivation and digital skills. On the other hand, the non-surgical alternatives require a life-time of dedicated, time-consuming home care and more frequent visits for evaluation and hygiene services. Overall, our experience suggests that only a small percentage of people have the will to follow through with the rigorous, essentially self-help programs necessary to control the disease without surgery. If you’ve been diagnosed with periodontal disease and, having heard all the pros and cons, must make a decision between a surgery and a non-surgery alternative, we suggest that you base your decision largely on what you know about yourself. Only you know if you have the discipline to follow a difficult program for life, or if you respond better to direct solutions, like surgery, to simplify the control of your disease. Of course, we will offer objective guidance, but in the final analysis, it’s your call.